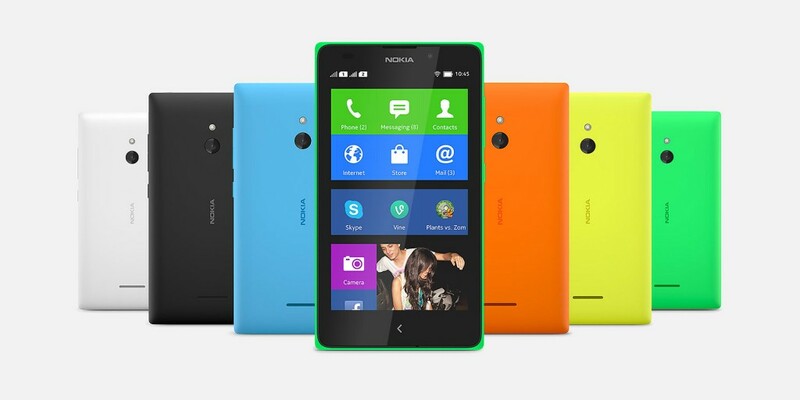 Nokia announced its first android series phones today at Mobile World Congress press conference 2014. The Nokia X family features Nokia’s renowned handset quality and design, with a fresh, tile-based user interface inspired by Lumia family. All devices come with Fastlane, a screen which lets people switch between their favorite apps more smoothly. Nokia X has 4-inch WVGA (800×480 pixels with 233 ppi) display and is powered by a 1GHz Qualcomm Snapdragon S4 dual-core processor paired with 512MB of RAM. Other features include Wi-Fi, Bluetooth, A-GPS, Dual-Sim, 4GB of internal storage with microSD supported upto 32GB, 3-megapixel camera and a 1500mAh battery. The Nokia X+ has similar specs, with increased RAM of 768 MB. The Nokia XL, sports a bigger display – 5-inch WVGA (800×480 pixels with 187 ppi) display and better cameras– 5-megapixel rear camera and 2-megapixel front-facing camera with 768 MB RAM and powered by 2000 mAh battery. The Nokia X is available immediately for 89 Euros in Asia-Pacific, Europe, India, Latin America, the Middle East and Africa. While the Nokia X+ and the Nokia XL will be available in the second quarter of this year for 99 Euros and 109 Euros respectively.